Quinoa is one of the most popular superfoods in the world and offers many health benefits. Quinoa is gluten free and is packed with protein and fiber. It has all of the essential amino acids that we need which makes it a complete protein. Quinoa is high in many minerals, including magnesium, potassium, and iron. It’s a great addition to many healthy dishes. 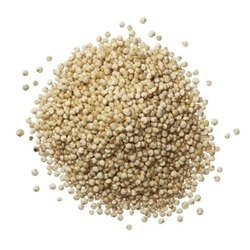 White Golden Quinoa has been used in South American cuisine for centuries. It is very versatile and can literally be used from breakfast to dinner, as a replacement to oat meal, a healthy side dish to any meat, poultry, or fish. It is delicious mixed with vegetables and herbs, added to any soup, combined with bread dough or with fruits for smoothies. The possibilities are endless.